While I will not be posting every APOD I do wish to post the ones that I find appealing. This one also relates to the recent post of the all sky Milky Way. This image concentrates on the Milky Way towards the galactic centre. Much of the galactic center is obscured by the dark lanes visible in this image. These lanes are present due to great clouds of gas and dust being located between us and the galactic centre. These clouds form dark nebulae. When gas and dust are located near a large star emission nebulae form. There are many emission nebulae present in this image. The constellations visible in this image include Sagittarius, Libra, Scorpius, Scutum, and Ophiuchus. Emission nebulae visible include M8, M16 and M20. 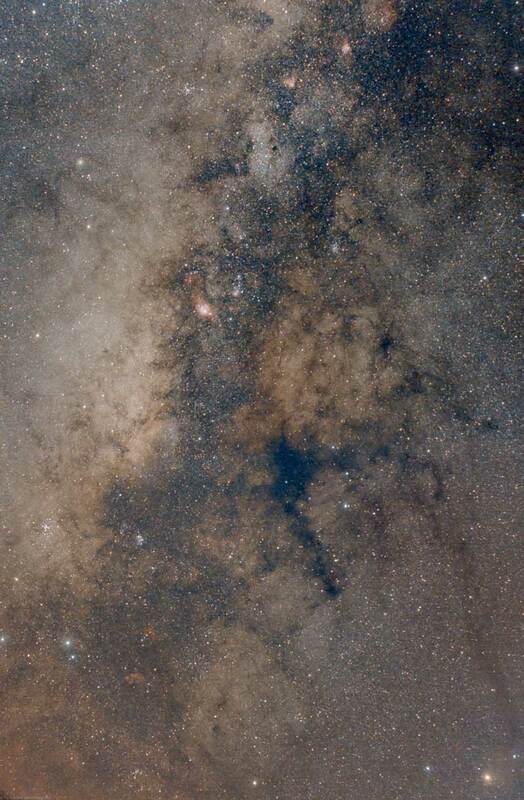 An example of a dark nebula in this image is the Pipe Nebula. There are numerous open clusters visible on the galactic plan and the globular M22 at a slight angle to the galactic plane. For an anotated version of this image see the APOD website. Click the image below for a larger version.